Commercial Industrial Storage Tanks - Peabody Engineering & Supply, Inc.
Peabody Engineering has over 60 years in commercial storage tank solutions delivering plastic storage tanks in all shapes and sizes, for any application or need. We are both an engineering firm and manufacturer, which allows us to work as a partner with customers all over the globe, designing durable, industrial-grade tanks that last. We offer a large variety of materials of construction and have a long list of successful completed projects that allows you a high level of confidence with every tank that comes off the assembly line. Today’s leading chemical manufacturers and distributors depend on Peabody Engineering’s rotational molded tanks made in the USA at the company’s Corona, CA facility. Designed specifically for Industrial, Water Treatment, Pharmaceutical, Oil & Gas and Agricultural applications, our tanks offer superior chemical resistance when storing compounds such as acids, caustics, sodium hypochlorite, biocides, high-purity products, etc. Recent releases include double-wall tank systems that provide a redundancy for high-profile and otherwise hazardous applications. If you are in need of a chemical storage solution, please look at our line of ProChem® chemical storage tanks for your application. Peabody Engineering’s durable, heavy-duty Gemini Dual Containment® Tank Systems are unaffected by the ultra-violet rays of the sun or other environmental conditions, which makes them perfect for indoor or outdoor use. The Gemini “Tank-in-a-Tank” design provides you with a perfect solution for storage and dispensing of your chemicals into your processes. 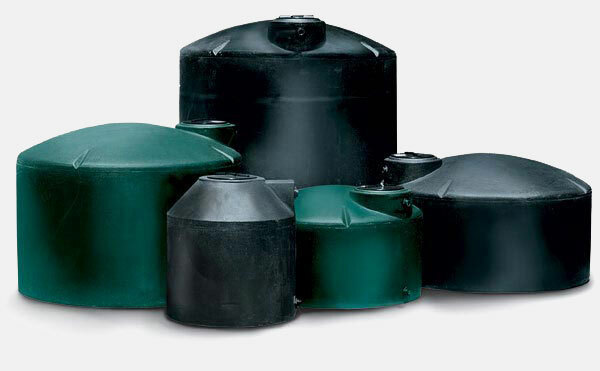 Offered in a variety of tank sizes in both round and square configurations, the Gemini Tanks, with standard features like the pump mounting platform, overflow dikes, vented lid and threaded fittings all included offer years of trouble-free and maintenance free service. 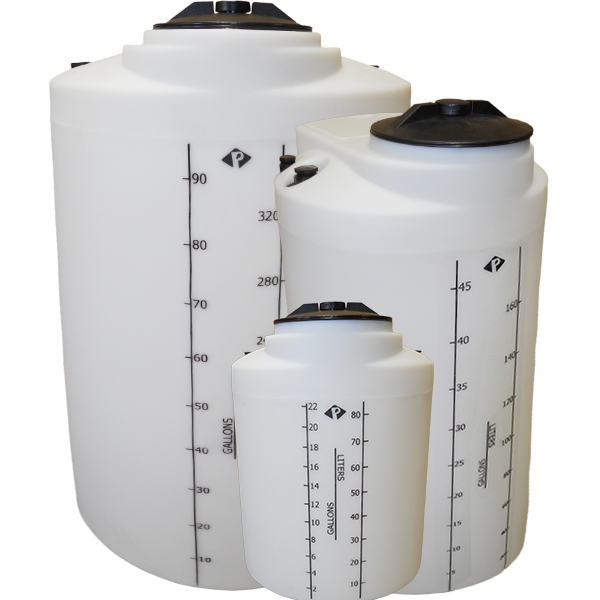 A large selection of standard accessories like suction tubes and level indicators compliment your tank for a complete, engineered dual containment tank solution. All of Peabody’s Gemini Dual Containment® tanks meet or exceed secondary containment requirements under EPA’s 49 CFR Regulations. We recognize that storage and containment are vital to our customer’s businesses and these processes are an investment for them. 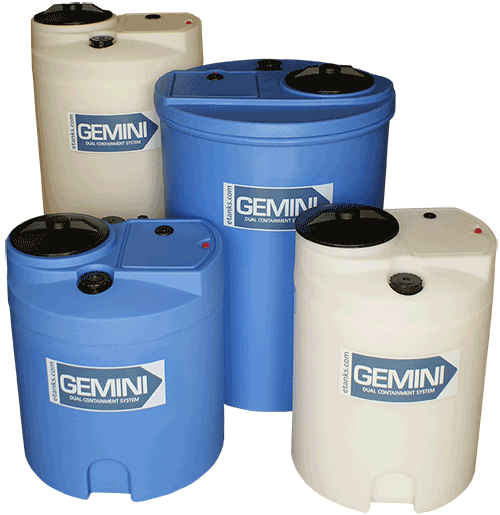 We are confident that our Gemini Dual Containment® Tank Systems will provide our customers with the ultimate double containment system for their applications. Peabody Engineering’s durable, heavy-duty “DCS” (Dual Containment Tank Systems) are unaffected by the ultra-violet rays of the sun or other environmental conditions, which makes them perfect for indoor or outdoor use. Uniquely designed as a one-piece unit, both the primary and secondary chambers are sealed from any environment. 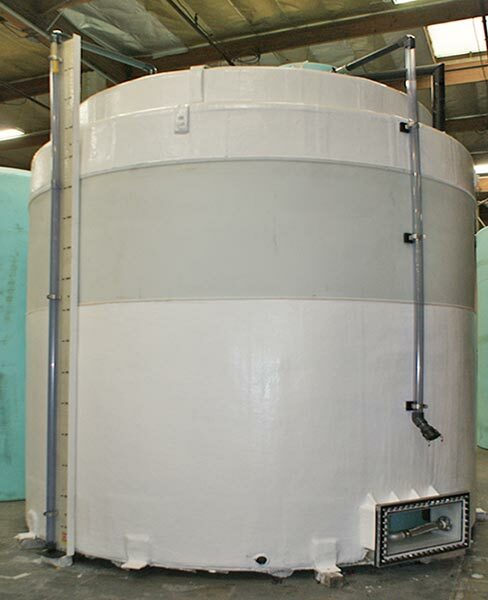 Offered in a variety of tank sizes and configurations from 500 to 10,500 gallon capacities, Peabody Engineering has included thermoplastic spacers to keep the primary tank in position for years of trouble-free and maintenance free service. A large selection of accessories compliment one-piece design including side access manways, overflow protection, level indication and seismic/wind restraint systems. All of Peabody’s DCS tanks exceed secondary containment requirements under EPA’s 49 CFR Regulations. We recognize that storage and containment are vital to our customer’s businesses and these processes are an investment for them. We are confident that our DCS Tank Systems provides our customers the ultimate double containment system for their applications. Peabody Engineering has successfully developed the best in class above ground water storage tank solutions for a number of applications. 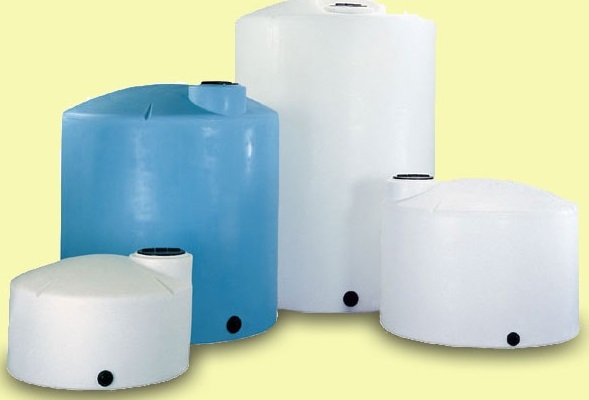 Our water storage containers can be found in use in farm operations, vineyards, agricultural irrigation, fire protection, water treatment, or low water shortage areas of concern. Peabody tanks can handle a complete range of chemicals for products from below 1.0 to above 12.0 on the pH scale. We use the best materials available on all of our tanks. They are UV stabilized and will not breakdown under harsh outdoor weather conditions and because they are 100% plastic, they will never rust, chip, peel, or corrode and are virtually maintenance free. Peabody potable water storage tanks are approved as drinking water tanks and are certified NSF-61 Compliant. What you can’t see can hurt you! When storing material underground, you want to be 100% sure of the quality, durability and reliability of your storage tank. Peabody Engineering uses virgin resin in our underground tanks to avoid contamination. Designed as a one-piece seamless watertight tank, our solutions meet FDA specs for potable and drinking water. The polyethylene material is not affected by chemicals in the soil, so it will not rust or corrode and requires no additional coating. Peabody Engineering’s below ground tanks offer a sustainable solution for your liquid storage needs. 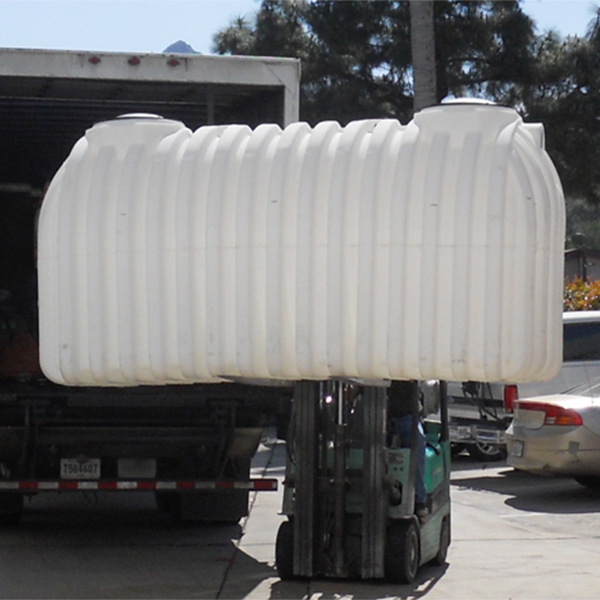 To learn more about our large variety of plastic underground storage tanks, please click here. Peabody Engineering offers a variety of bulk storage, open top tanks or closed top tanks ranging in capacity from 5 gallon to 500 gallons and vertical storage tanks from 22 gallons to 20,000 gallons. Our Bulk Storage tanks are designed for industrial-duty process and manufacturing applications where quality and design are important. Bulk Storage tanks are commonly used as chemical storage tanks, chemical process tanks, plating tanks, fertilizer tanks, secondary containment basins, hydroponics tanks, fish breeding operations, water storage and more. Peabody tanks are your best choice for all applications where failure is not an option. Our tanks provide rugged resistance to corrosive chemical assault, in addition to durability during moving and handling. They are well suited for wet or dry storage of industrial and commercial chemicals, as well as food commodities and have the Calibration in gallons and (in some tanks) Liters molded into the tank to allow for quick level indication. Peabody also offers tanks in other configurations, like cone bottom, horizontal and closed top rectangular for other applications where flat bottom tanks are not ideal. 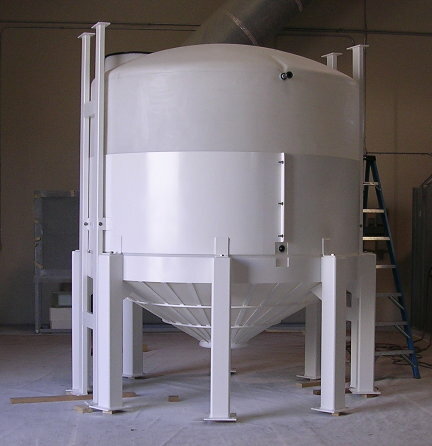 We make custom designed tank systems engineered to meet the specific requirements of YOUR application. With over 50 years’ experience supplying tanks, Peabody Engineering builds tanks engineered to perform and built to last. High-Density Linear Polyethylene Tanks, made in single or double wall, can be built up to 20,000 gallon tank capacity. We can help you from start to finish with specifications, design, engineering, fabrication and delivery of your engineered tank solutions.